Memory for Emotional and Nonemotional Events in Depression: A Question of Habit? The truest claim that cognitive science can make might also be the least sophisticated: the mind tends to do what it has done before. In previous centuries philosophers and psychologists invented constructs such as associations, habit strength, and connectivity to formalize the truism, but others have known about it, too. In small towns in the Ozarks, for example, grandmothers have been overheard doling out warnings such as, "Don't think those ugly thoughts; your mind will freeze that way." Depressed persons, like most of us, usually don't heed this advice. The thoughts frozen in their minds might not be "ugly," but they often reflect disappointments, losses, failures, other unhappy events, and a generally negative interpretive stance toward ongoing experience. By considering these habits of thinking, we should better understand the nature of memory in depressed states. Deliberate attempts to remember are either impaired or facilitated in ways that appear related to habits of thinking. 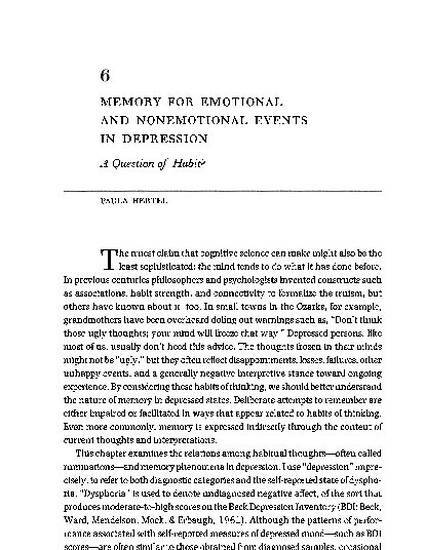 Even more commonly, memory is expressed indirectly through the content of current thoughts and interpretations. Hertel, P. T. (2004). Memory for emotional and nonemotional events in depression: A question of habit? In D. Reisberg & P. Hertel (Eds. ), Memory and emotion (pp. 186-216). New York: Oxford University Press.